As you likely know, deciding whether or not to enable V-Sync will typically affect a game in one way or another. With it disabled, the game’s frame rates won’t be limited to the refresh rate of your monitor. This means higher FPS overall but it also leads to screen tearing – when multiple frames become trapped in a single refresh during quick on-screen movements – and well, nobody likes that. Enabling V-Sync forces your GPU to pump out just 60 frames per second which puts it in sync with a typical monitor’s refresh rate of 60 Hz. It helps to eliminate screen tearing but at the same time, you’re limited to just 60 FPS. Many of today’s higher-end cards and multi-card configurations are capable of pushing frames at a much faster rate. Faster FPS means better quality and more responsive input but until now, gamers have had to choose between one or the other. The G-Sync module synchronizes the monitor’s refresh rate to the GPU’s render rate which means images are displayed the moment they are rendered. This supposedly translates into scenes appearing instantly with sharper objects and smoother gameplay. 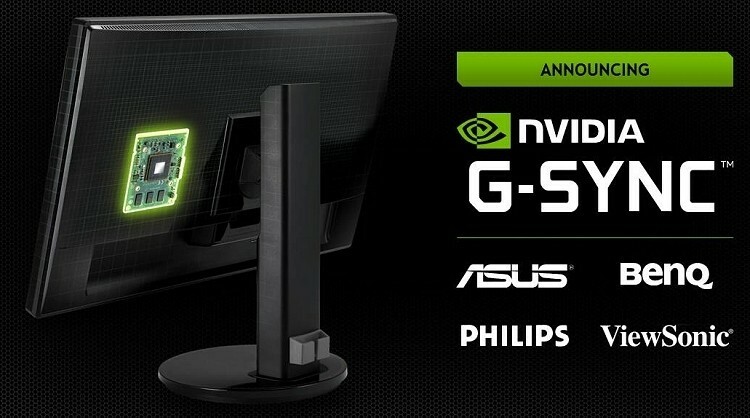 We’re told that G-Sync monitors will be available starting early next year. No word yet on pricing for new monitors, though a G-Sync add-on that will work with the Asus' VG248QE 144Hz monitor will cost $175, giving us a hint that G-Sync enabled monitors will carry a $100-150 premium. "The huge gains in GPU rendering power over the past decade have enabled developers and artists to create increasingly complex 3D scenes and worlds. But even on the highest end PC, the illusion of reality is hampered by tearing and stutter. NVIDIA G-SYNC elegantly solves this longstanding problem. Images on a G-SYNC display are stunningly stable and lifelike. G-SYNC literally makes everything look better." "NVIDIA's G-SYNC technology is a truly innovative solution to an ancient legacy restriction with computer graphics, and it enables one to finally see perfect tear-free pictures with the absolute lowest latency possible. The resulting output really allows your mind to interpret and see it as a true continuous moving picture which looks and feels fantastic. It's something that has to be seen to be believed!" "With G-SYNC, you can finally have your cake and eat it too -- make every bit of the GPU power at your disposal contribute to a significantly better visual experience without the drawbacks of tear and stutter."